The Hotel & Aparthotel Casteau Mons is ideally located whether traveling for business or leisure while in Belgium. The Hotel & Aparthotel Casteau Mons is near the Supreme Headquarters Allied Powers Europe (SHAPE), the central command of NATO military forces. Hotel guests are also near several business locations including Mac Tac, Holcim and Akzo Nobel. Hotel & Aparthotel Casteau is the hotel with the closest proximity to the SHAPE offices. Please go to our online booking tool and add your SHAPE code fo obtain your preferred rates. The Hotel & Aparthotel Casteau Mons is 15 kilometers from the animal park Paira Daiza, the golf courses « du Hainaut » & « Mont Garni », the « hippodrome de Wallonie » and 50 kilometers from attractions in Brussels, Belgium. Each well-appointed room comes equipped with satellite television, free WIFI, safe, fridge and bathroom with shower or bath.. The privileged location of the hotel, in the heart of the region Bergen in a calm and green sorroundings. Our pleasant bar "Le Castellois"
Book your table at one of the restaurants in our neighbourhood and enjoy a delicious lunch or dinner. Please find a list of nearby restaurants here. For every newly-wed couple, we offer breakfast in the room. In addition to that, the couple can enjoy a late check-out until 2PM. Don't forget to mention during your reservation, if this promotion is applicable to you. © 2015 Hotel Casteau resort Mons. All right reserved. 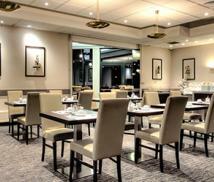 Hotel Casteau resort in Mons is part of We Care Hotels.